From the menu bar, choose Objects→New Drop Down. A drop-down dialog box appears. 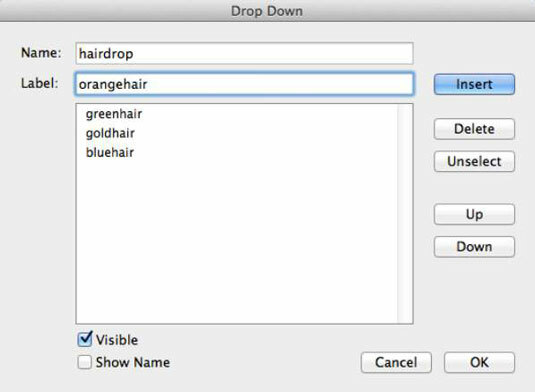 In the Name field, type the name of the list, such as hairdrop. 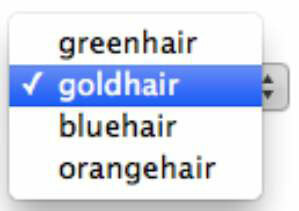 In the Label field, type the name of the first shape in the collection, such as orangehair. Click Add (Windows) or Insert (Mac) to add the shape name to the list. Repeat Step 3 to add three more labels — greenhair, goldhair, and bluehair — to the list. To remove a label, select it and click Delete. To adjust the order of the labels, click any label and click Up or Down. To choose which label shows when the drop-down list appears in the workspace, click that label. To show a blank space when the drop-down list appears in the workspace, click Empty (Windows) or Unselect (Mac). Leave the Visible option checked and the Show Name option unchecked. Click OK to finish making the drop-down list. The drop-down list is added to the workspace. Check that the drop-down list names the shapes correctly by clicking the selection arrows on the right side of the drop-down list. Drag the drop-down list to position it on your toy. 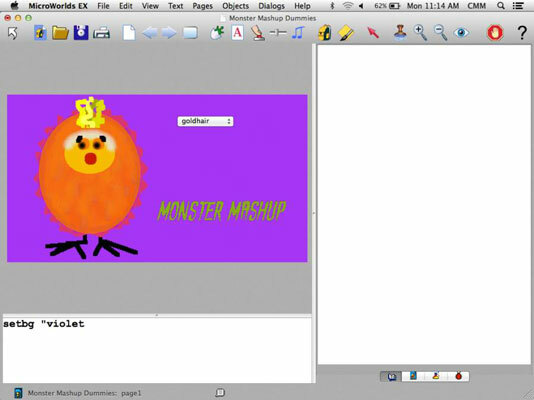 At this point, the shape on the monster might not match the shape showing in the drop-down list. That’s because the function of the drop-down list is to show the choices for the monster part, not to change the shape. For each part, you will create a procedure and button to change the shape to a choice from the drop-down list.